Sadly the cartoon for the Conversion of Saul has been lost. 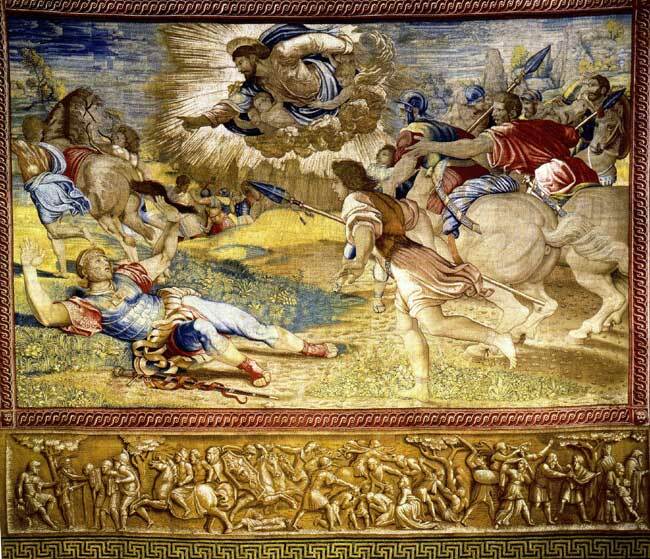 That is a great pity because from the completed tapestry we can see the drama of Raphael's original design, the strong figures and powerful composition give some insight into what must have been a magnificent painting. The figure of God appears to fill the sky as Saul falls helpless, struck blind by the heavenly apparition. In the background two grooms attempt to calm the horse that has just unseated Saul, the foreground is completed by the onrushing group who come to Saul's aid. After three days Saul regained his sight and was converted from the persecutor of Christians into a follower of Jesus Christ, he became the missionary St Paul and preached throughout the Mediterranean. This is a bold sweeping composition by Raphael, what a pity that the cartoon has been lost and we can no longer compare the works together. This tapestry was stolen during the sack of Rome in 1527. After surfacing in France, it was returned to the Papacy in 1554 along with the tapestry, Paul Preaching at Athens, which was also stolen at the same time.